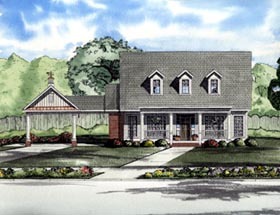 Dormers and a charming porte cochere give this single story home a unique appearance. A timeless covered porch stretches across the front of this design and ushers your guests inside. An inviting atmosphere is created by the fireplace and media center included in this great room. The computer center and kids nook should help to keep the kids busy and close by. An appealing master suite and two additional bedrooms complete this luxury-filled design.